Heat the oil on a medium-size frying pan at medium heat. Cook the hot dogs thoroughly and until lightly browned. Remove from frying pan and place on paper towels. Slice open the hot dog buns. Place hot dogs inside of buns. Add onions, cabbage, tomato sauce, and mayonnaise, mustard and corn sauce, to taste. Top with crunchy fries and yellow cheese. It's amazing how many versions of hot dogs there are. Depending on the country or even the city, we can find a variety of fillings. Today I bring you a Venezuelan version of this very popular food. 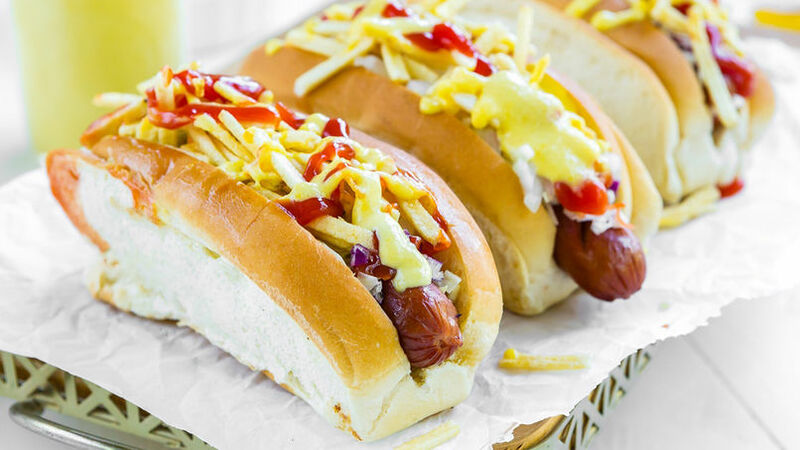 In Venezuela, hot dogs are served with chopped onions, cabbage, crunchy skinny fries and all kinds of sauces, including corn sauce since it adds a unique and delicious touch. Enjoy!